New to the IMM is a Dual-Beam-FIB Helios Nanolab 600i from FEI, which came in summer 2014. 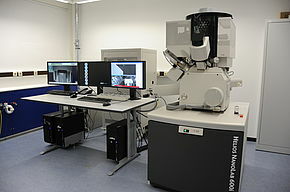 This high resolution scanning electron microscope is additionally equipped with a focused ion beam (liquid gallium source). With this ion beam it is possible to prepare micropillars for compression experiments as also to cut site specific lamella for TEM investigations. Prior to this the samples can be characterized comprehensively by EBSD- and EDS-systems (both EDAX/ Ametek) in addition to the built-in detectors (SE and QBSD). By sweeping between electron and ion beam, suitable samples can also be analysed by EBSD and EDS in 3D, also in combination of both. Within the FIB pre-prepared TEM-lamella can directly be investigated in STEM-mode (scanning transmission electron microscopy).